I recently posted a tutorial to add orkut share button to WordPress and blogger blogs. Using that tutorial you can manually add orkut share button to your WordPress based blogs but if you don’t want to mes with the coding of your theme then here is a WordPress plugin to add ‘Orkut Share’ button to your blog. ‘Share on Orkut’ WordPress plugin is released by OrkutPlus. 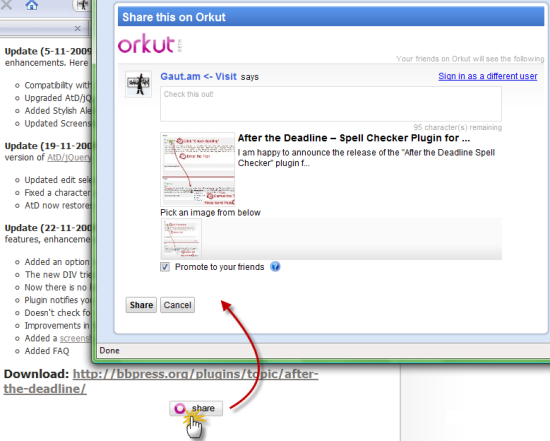 This plugin adds a orkut share button below every post in your WordPress blog. Download this plugin : You can download this plugin from the official WordPress plugin page. Click here to download this plugin. Previous Article How To Add Orkut Share Button To WordPress And Blogger Blogs ? Thanks for mentioning about the plugin here! .-= Gautam´s last blog ..After the Deadline Plugin for bbPress now Live on WordPress.com Forums! =-. Thanks for telling about the plugin friend and also for the download link. .-= Bimal Roy´s last blog ..Best Top Photoshop Tutorials of 2009 =-. Orkut is a copycat.. Its copying each and every feature from Facebook and Twitter. This plugin will helpful i think.I am going to add my blog soon. Oh! glad to see your post. .-= mathan´s last blog ..Best Latest release Mobiles in Nokia =-. Cool , the plugin looks good.will it wok on wp 2.7 ? .-= Sourish Nath´s last blog ..Speed Dial and FoxTab Addon for Easy browsing in Firefox =-. But the trouble is many of my plugins wont work like Featured Content gallery . There are two things that I possibly want to say about this post. One positive point and other is its converse. The positive point is that, I liked this plug-in very much, after all I don’t know that there is a plugin to share stuff at orkut. The negative point is that, the article is not very descriptive. You must have added few more screen shots or explained the post in detail so that the reader can have a better understanding of what u are saying. .-= Provamsi @ India365´s last blog ..List Of Bloggers Who Has a Very Good Habit Of Commenting On Other Blogs =-. Actually I have added description about this plugin in my previous article that I have linked in the starting of this post. You can read more about this plugin in that article. I don’t want to write the same thing again and again.